(Nanowerk News) For much of the 20th century, many of the technological innovations that drove U.S. economic growth emerged from "idea factories" housed within large companies -- research units like Bell Labs or Xerox PARC that developed everything from the transistor to the computer mouse. "Small startups have replaced corporate research centers as the drivers of American innovation," said Orville Butler, a former historian at the American Institute of Physics (AIP) and coauthor of a new AIP report on physics startups. 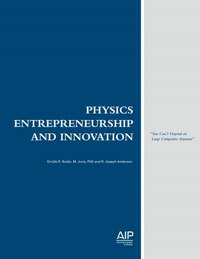 The cover of 'Physics Entrepreneurship and Innovation' The report, titled Physics Entrepreneurship and Innovation (pdf), is based on extensive interviews with 140 PhD physicists and other professionals who co-founded and work at some 91 startup companies in 14 states that were established in the last few decades. These companies are engaged in making medical devices, manufacturing tools, nanotechnology, lasers and optical devices, renewable energy technologies and other products.